Getting a degree in business, management, or finance can springboard you into a lucrative career in banking, finance, or the hedge fund industry. The FT took loads of data from business schools, including average salaries, the increase in salary its graduates see three years after finishing their degree, and the percentage of grads in work three months after finishing school. It then collated that data to create a great list of all the best schools in Europe for aspiring bankers, hedge funders, and businesspeople. The schools are spread across the whole of the continent, although the UK, France, and Switzerland have the most universities at the top of the list. 17. Grenoble Ecole de Management — The French business school is one of several from the country on this list. In the FT's MBA ranking earlier in 2016, it was shown that the school has an average alumni salary of $93, 680, and MBA holders get a salary increase of 80%. 16. Imperial College Business School — Imperial, one of London's finest universities, is better known for its scientific and mathematics-based courses, but it has a top business school. Imperial alumni include the former CEOs of major companies like Singapore Airlines and Rolls Royce. 15. Vlerick Business School — An autonomous part of the Katholieke Universiteit Leuven, one of Belgium's top universities, Vlerick has fewer than 400 students at a time. It still manages to produce top quality alumni, including Nestle CEO Paul Bulcke. 14. Edhec Business School — The school, which is based in Lille, France, but teaches its MBA course in the coastal town of Nice, had the 26th best full-time MBA in the world in the FT's annual ranking, helping it become Europe's 14th best school overall. 13. Judge Business School, University of Cambridge — Consistently ranked as one of the top 3 universities in the world, Cambridge is better known for teaching the sciences and educating prime ministers. Its business school, named for benefactor Sir Paul Judge, is also world class however. 12. ESCP Europe — ESCP is a pan-European school, with campuses in six major business centres (London, Berlin, Paris, Turin, Madrid, and Warsaw) and is the oldest business school in the world, established in 1819. Alumni include the EU's chief Brexit negotiator Michel Barnier, and former IMF chief economist Olivier Blanchard. 11. Said Business School, University of Oxford — Oxford is synonymous with Britain's top politicians and captains of industry. Its alumni include the famed Winklevoss Twins, who sued Facebook founder Mark Zuckerberg, claiming he stole the idea from them while they were at Harvard together. Attendees are taught by the Said school, but are members of colleges like Keble (pictured below). 10. 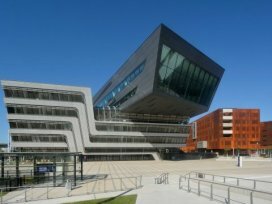 Rotterdam School of Management, Erasmus University — The premier business school in the Netherlands, Rotterdam School of Management has educated senior business figures including the former CEO of FTSE 100 consumer brands company Reckitt Benckiser and Dutch banking giant ING. 9. International Institute for Management Development — Often know by its abbreviation, IMD, the school is located in the Swiss city of Lausanne and counts Dutch prime minister Mark Rutte as one of its alumni. The school's full-time MBA was the 5th best in the world in the FT's Global MBA ranking earlier this year. 8. IESE Business School — The school is attached to the University of Navarra in Spain, and was initially launched as an initiative of the Catholic organisation Opus Dei. It has campuses in Barcelona, Madrid, and New York. T6. SDA Bocconi — The Bocconi School of Management in Milan is officially the best business school in Italy, according to the FT. Alumni include former Italian PM Mario Monti, as well as footballer Clarence Seedorf. T6. ESADE Business School — Short for Escuela Superior de Administración y Dirección de Empresas, ESADE is located in Barcelona, and has the 8th best full-time MBA programme in the world, the FT says. 5. University of St Gallen — Specialising in business administration, economics, law, and international affairs, St Gallen, in the north of Switzerland, is a surprise entry so close to the top of the list, although it counts former Deutsche Bank CEO, and current Bank of Cyprus chairman Josef Ackermann among its alumni. 4. IE Business School — Another Spanish entry near the top of the FT's best business schools in Europe list, people with MBA's from Madrid's IE earn an average of $159, 266. 3. INSEAD — The alma mater of Credit Suisse CEO Tidjane Thiam, INSEAD is located about 35 miles from Paris in the city of Fontainebleau. INSEAD was 3rd overall in the FT's business school ranking for a second consecutive year. 2. HEC Paris — The Parisian business school has been the Financial Times' runner-up for Europe's best business school for all of the past three years. Many of French business' biggest names, including L'Oreal CEO Jean-Paul Agon, and BNP Paribas chairman Baudouin Prot attended the university. 1. London Business School — Officially the top business school in the UK and the whole of Europe, according to the FT, London Business School has been the best on the continent for three consecutive years. Business Studies at Brampton College - The best sixth form college in London.